Although Hurricane Sandy did not reach Category 5 maximum storm intensity on the Saffir-Simpson scale, this tropical cyclone devastated portions of the Caribbean, Mid-Atlantic and Northeastern United States in late October. The reported death toll from hurricane Sandy's flooding and high winds has now reached above 150. Preliminary estimates of losses that include business interruption surpass $50 billion (2012 USD), which, if confirmed, would make it the second-costliest Atlantic hurricane in history, behind only Hurricane Katrina. A tropical wave developed into Tropical Depression Eighteen at 1200 UTC on October 22 2012, while located about 350 miles (560 km) south-southwest of Kingston, Jamaica. Six hours later, it strengthened into Tropical Storm Sandy. Initially, the storm headed southwestward, but re-curved to the north-northeast due to mid to upper-level trough in the northwestern Caribbean Sea. A gradual increase in organization and deepening occurred, with Sandy becoming a hurricane on October 24. Several hours later, it made landfall near Bull Bay, Jamaica as a moderate Category 1 hurricane. In that country, there was 1 fatality and damage to thousands of homes, resulting in about $100 million in losses. After clearing Jamaica, Sandy began to strengthen significantly. At 0525 UTC on October 25, it struck near Santiago de Cuba in Cuba, with winds of 115 mph (185 km/h); this made Sandy the second major hurricane of the season. In the province of Santiago de Cuba alone, 132,733 homes were damaged, of which 15,322 were destroyed and 43,426 lost their roofs. The storm resulted in 11 deaths and $2 billion in damage in Cuba. It also produced widespread devastation in Haiti, where over 27,000 homes were flooded, damaged, or destroyed, and 40% of the corn, beans, rice, banana, and coffee crops were lost. The storm left $750 million in damage, 54 deaths, and 21 people missing. Figure 1: Track of the eye of Hurricane Sandy in October 2012. The storm weakened slightly while crossing Cuba and emerged into the southwestern Atlantic Ocean as a Category 2 hurricane late on October 25. Shortly thereafter, it moved through the central Bahamas, where three fatalities and $300 million in damage was reported. Early on October 27, it briefly weakened to a tropical storm, before re-acquiring hurricane intensity later that day. In the Southeastern United States, impact was limited to gusty winds, light rainfall, and rough surf. The outerbands of Sandy impacted the island of Bermuda, with a tornado in Sandys Parish damaging a few homes and businesses. Movement over the Gulf Stream and baroclinic processes caused the storm to deepen, with the storm becoming a Category 2 hurricane again at 1200 UTC on October 29. Although it soon weakened to a Category 1 hurricane, the barometric pressure decreased to 940 mbar (28 inHg). At 2100 UTC, Sandy became extratropical, while located just offshore New Jersey. The center of the now extratropical storm moved inland near Brigantine late on October 29. In the Northeastern United States, damage was most severe in New Jersey and New York. Within the former, 346,000 houses were damaged or destroyed, while nearly 19,000 businesses suffered severe losses. In New York, an estimated 305,000 homes were destroyed. Severe coastal flooding occurred in New York City, with the hardest hit areas being New Dorp Beach, Red Hook, and the Rockaways; eight tunnels of the subway systems were inundated. Heavy snowfall was also reported, peaking at 36 inches (910 mm) in West Virginia. Additionally, the remnants of Sandy left 2 deaths and $100 million in damage in Canada, with Ontario and Quebec being the worst impacted. Overall, 286 fatalities were attributed to Sandy. Damages totaled $65 billion in the United States and $68 billion overall, making Sandy the second-costliest Atlantic hurricane in recorded history, behind only Hurricane Katrina in 2005. In diameter, it was the largest Atlantic hurricane on record, with winds spanning 1800 km. Unusually warm ocean surface temperatures contributed to the size and strength of the storm. Natural variability and weather has provided the perhaps optimal conditions of a hurricane running into extra-tropical conditions to make for a huge intense storm. Sandy is an example of what is called a hybrid storm. It works on some of the same principles as the way hurricanes work but it also works on the same principles as winter storms work. Hurricanes and winter storms are powered by completely different energy sources. The hurricane is powered by the evaporation of sea water. Winter storms are powered by horizontal temperature contrasts in the atmosphere. So hybrid storms are able to tap into both energy sources. That’s why they can be so powerful. Figure 2: Estimates of Surface Wind Speeds from SMOS data along the track of Hurricane Sandy in October 2012. Click on the Image to the see the gif animated. As already demonstrated during the passage of Category 4 Hurricane Igor in 2010, SMOS L-band radiometer sensor has the unique ability to see through clouds and rain bands to provide reliable estimates of the surface wind speeds under intense storms. As illustrated in Figure 2 animation, SMOS swath intercepted parts of Hurricane Sandy at least 8 times from its passage over Jamaica and Cuba around the 23 October until its landfall in New Jersey, USA on October 29. Surface wind speed were estimated from SMOS data over Sandy using the algorithm developed for Igor Hurricane in 2010 [Reul et al., 2012] in the frame of the ESA/STSE SMOS+STORM study . As illustrated by the above figure 3, estimates from SMOS sensor compared well with real-time measurements from several meteorological buoys of the NOAA/NDBC array (National Data Buoy Center) as the Category 1 Hurricane Sandy passed between US coasts and the Bermuda Islands. 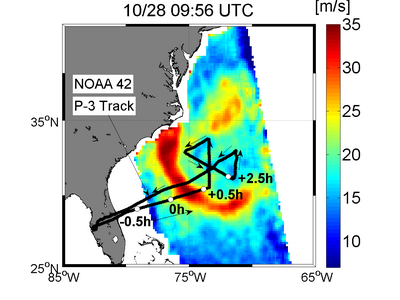 To gather Doppler radar and other data for assimilation into numerical models, the Hurricane Research Division of the Atlantic Oceanographic and Meteorological Laboratory of NOAA (National Oceanic and Atmospheric Administration) furthermore conducted a series of seven P-3 aircraft campaigns into Hurricane Sandy. In particular, the surface wind speed and Rain rates retrieved along the aircraft tracks using the data acquired by the onboard Step Frequency Microwave Radiometer (SFMR) instrument provide with an additional data set to check the quality of the SMOS high wind speed retrievals. The sixth NOAA P-3 mission was thus conducted as Hurricane Sandy continued to move northward up the east coast coincidently with the morning SMOS overpass of Sandy the 28th October at 09:56 UTC. Keeping in mind the significantly differing sampling characteristics of both sensors (SFMR and SMOS spatial resolution are 1 km and 43 km on average, respectively), Figure 4 reveals an excellent agreement between the two estimated surface wind speeds along the aircraft track. In particular, both instruments consistently detected an high wind band ~150 km south of the hurricane eye with wind speed above 30 m/s and recorded similar wind speed structure around the eye wall, which was crossed twice by the P3 aircraft (at around +0.8 and +2.2 hours after SMOS). 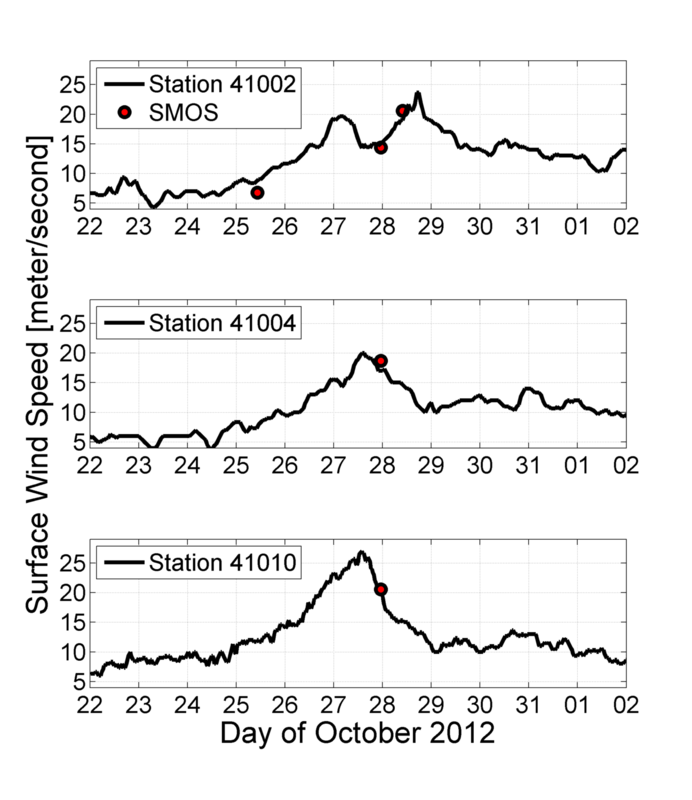 Figure 4: Left: SMOS estimated surface wind speed as the satellite overpassed Hurricane Sandy the 28th Oct at 09:56 UTC. The track of the NOAA 42 P-3 aircraft flight is superimposed (black curves). White dots indicates the aircraft location at successive times with respect to SMOS acquisition. Right: Co-located SFMR (black) and SMOS (red) surface wind speed estimates along the P-3 track. SFMR estimated rain rate is also shown in grey [mm/h]. Click on the images to see larger views. Because of SMOS instrument significantly lower spatial resolution than the SFMR, locally smoother wind speed distributions are retrieved from Space around the strong horizontal gradients (particularly around the eyewall). Nevertheless, this analysis certainly again demonstrates the strong potential of L-band radiometers for ocean surface properties monitoring in hurricane conditions. Finally, note that maximum differences between the C-band SFMR and the L-band SMOS wind speed retrievals are found as the aircraft was flying over intense rain-bands (rain-rates above 15-20 mm/hour). Rain impact on the signal at C-band (4-8 GHz) and L-band (1.4 GHz) can be approximated entirely by absorption and emission. SFMR wind speed retrieval algorithm uses mutliple C-band frequency channel combinations that are sufficiently sensitive to wind speed, and only weakly sensitive to rain. SMOS algorithm simply neglects rainfall impact at L-band. Due to the fact that the absorption coefficient by rain drops is extremely small at 1.4 GHz, only emission under heavy rain may contributes to the signal by enhancing the brightness temperatures. Not accounting for that effect in rain band area would therefore results in overestimating the local retrieved wind speed. As shown in Figure 4, this is not what is observed in SMOS data where SFMR crossed intense rain bands, suggesting least affected measurements. Nevertheless, locally intense rain events found in hurricane are usually very short-lived (less than half an hour) and strongly intermittent. As such events were detected by SFMR more than one hour after SMOS passage, non-coinciding local rain events might also explain the observed differences. Finally, when heavy and light rain co-exist within the SMOS footprint, the actual rain impact on L-band brightness temperature shall be also significantly reduced due to the footprint spatial averaging.